With another "Year of the Pitcher" behind us, opposing owners now draft starting pitchers earlier than ever. While this hinders our ability to find bargains, remember that we do not have to follow suit. The thirtieth best starter proportionally still represents the thirtieth best starter, just one with improved statistics. Because so many overvalue saves, few values exist among relief pitchers. Getting a fair price early on will suffice as a bargain, while a couple late discounts await. Let’s look at where the values lie when comparing our BaseballHQ.com values to the Average Draft Positions from MockDraftCentral.com. MARKET PULSE: Second Baseman in the Second Round? For years we have preached not to overplay the scarcity card. Despite depth at second base, however, few late values exist. Managers overrate scarcity throughout the draft. So here, it may pay to take a superstar who mans the keystone early, because their production will equal their actual value. With outfielders, we find more value disparities than any other position. One clear rule emerges: others overvalue youth and undervalue reliability. Having so many more roster spots causes outfielders to fall if your leaguemates overvalue positional scarcity. While many lament scarcity at third base, you will find just as many options as first basemen. Whether good or bad, you see a similar dropoff after after the top eleven or so go off the board. If you miss them, plenty of risky players with upside remain later in the draft. For years we have warned you about scarcity at first base. With many looking at this position for Corner Infield and DH spots, the field gets thin quickly. In 2012, scarcity of the proven talent you need to anchor squad rears its head at first base after the first three rounds. MARKET PULSE: Beware the Catcher Gap! [FREE] If you don't get a top-eight catcher, a massive gap exists until replacement-level. While others overvalue positional scarcity to draft backstops too early, we reveal the ideal targets in the middle and end of your draft by comparing ADP's to our BaseballHQ.com projections. 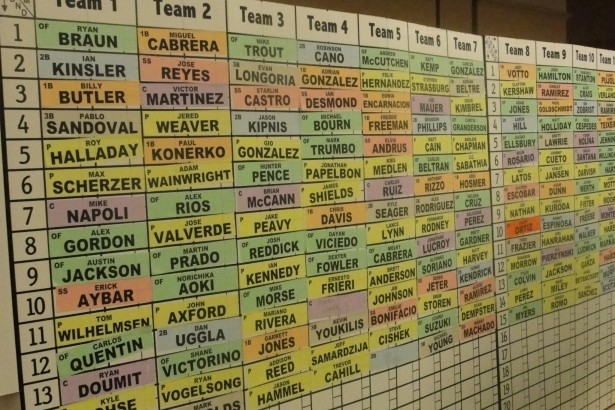 It's almost here--that dreaded day when fantasy baseball ends and all that's left is (gulp) fantasy football. For those still in the running for something: mazel tov! Here in the homiest of stretches, with just a few weeks left, all players are risky. Prince Fielder could slump or C.C. Sabathia could throw a couple of clunkers. All things being equal, we should still expect the best players to perform the best. But some lesser players will get hot in September, and these guys may just do enough to put you over the top. Here, we will again focus on players who have been playing well as of late, hoping to capitalize on a hot three weeks. RESEARCH: A Hitter Matchup Tool?